We’ve been working on moving my cousin into a long-term care facility, and in the course of doing this, we’ve been going through a lot of old photos. 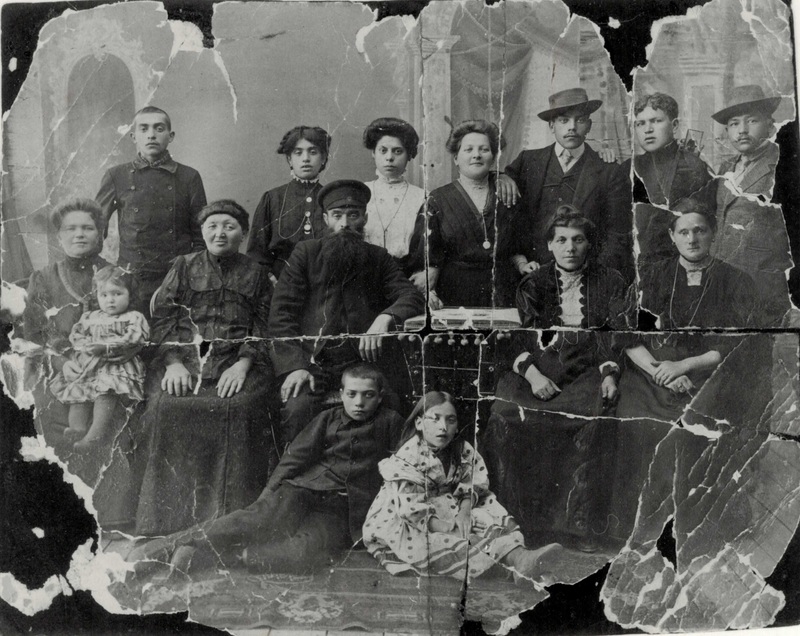 This one is truly incredible though — this picture shows my great-great grandparents and my great-great-great grandparents on my mother’s side! 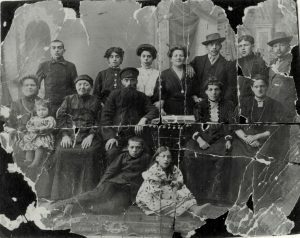 The fourth and fifth people on the top row are my great-great-grandparents and the third and fourth people on the bottom row (including the guy with the Rasputin beard) are my great-great-great grandparents! To me, this is just a stunning thing to see. There are no dates, but I’m guessing that this picture was probably taken in the 1860s, either in Poland or in Russia. The oldest generation in this picture could have been born 200 years ago, in the 1810s or 20s. We don’t know who drew this either, but it is possible that it was drawn by my grandfather Nat (married to Polly) — it looks sort of like other things he has drawn and might be his handwriting. It is amazing to see something like this, but also frustrating to not know anything more about it–the names of all the people and their stories, or even when and where the photo was taken. I do not have any children, but my cousins Elissa and Shelley do. For their children, this picture shows their Great-great-great-great-grandparents! Update: Lots of comments and communication about this photo from various family members. The baby Lily (Sheldon, née Herskine) was born in 1909, so the photo must be around 1910, and the relationships were off by a generation. The older couple in the front are merely my great-great-grandparents, probably just going back to the 1850s-1860s. The man on the top-right with the hat who is labelled “Jack, Lionel & David’s father” was called Alec. I love this!! Thanks for sharing Arlen!!! and amazed how much Grandma looked like her mother! My kids are fascinated!!! Lovely to hear from you – I’ve heard my mum talk about you! The cousin is Stephen Rugg, who is Edie’s son. Thanks for replying, I remember Stephen, David and I visited with him in 1969, shame he is now going into a care home, not sure where all the years have gone. Please give my love to your mum.